I am lying in my tent here at Camp 2, with the hot sun shining on the tent, which is fairly blissful as at least I am warm! I keep thinking about my climb up here yesterday, and how I felt, so I’ve scribbled it down….this is what came as I relived the tension and doubts…. As I teetered on my crampons in the middle of the last ladder, I willed myself not to look down. I didn’t need to. I knew exactly what was there. It was a very large, very deep black hole and I didn’t need to check, it wouldn’t have gone away. But there was something compelling about it, and as I stood wobbling uncertainly in the middle of the ladder my gaze involuntarily fell to my feet and the seemingle bottomless chasm below. Well, maybe it wasn’t exactly black, more blue grey really with a hint of green – ice has more colours in it than you would think. My crampon points slipped on the smooth metal of the ladder and I swore under my breath, clutching at the ropes on either side of me. Jerking my eyes back up I stared at the rungs in front of me and counted how many I had left to cross. Ten. If I took them two at a time that was five steps. Five steps between me and solid ground – if you can call a moving glacier ‘solid ground’. The trouble was the ropes on either side of me were slack and without someone else to pull on them to make them taut, they gave virtually no support. I felt as though I was walking on a tightrope. I took a deep breath and, pulling the rope towards me to create some tension I took another tentative step and a few seconds later I was slumped in the snow on the far side of the crevasse. I sighed with relieve. No matter how many times I did this it just didn’t seem to get any easier. Nothing can prepare you for crossing several ladders tied together, with just a rope for a handrail and a drop of goodness knows how many hundred feet below you. But I had to admit it was worth it for the view. Easing my rucksack off my aching shoulders I lay back against it and surveyed my surrounding. The Western Cwm. The majestic, awe-inspiring, magnificent Western Cwm. No amount of superlatives could convey the beauty and splendour of it all. It never failed to take my breath away. Nuptse, Lhotse and Everest, their seemingly vertical walls falling away thousands of metres to the floor of the cwm. I craned my neck and looked up. There was a plume of cloud coming off Everest today, it must be windy up there on the summit. The summit. It seemed so far away. But then again, I thought, that’s probably because it is. Approximately 8000 feet above me in fact. I sighed again, and not for the first time was assailed with doubts. That is a very long way. I had been worrying about this ever since our initial visit to Camp 2 several weeks ago. The summit of Everest isn’t visible from Base Camp as it is hidden by the mountain’s West Shoulder, and it was not until I walked round the corner from Camp 1 on my initial trip up here, that I was confronted for the first time with the sheer enormity of it all. I don’t simly mean the vastness of the mountain, but the huge scale of the task I had undertaken. It literally too my breath away. For the first time since I had set foot on the mountain the whole of the route to the summit was at last revealed. 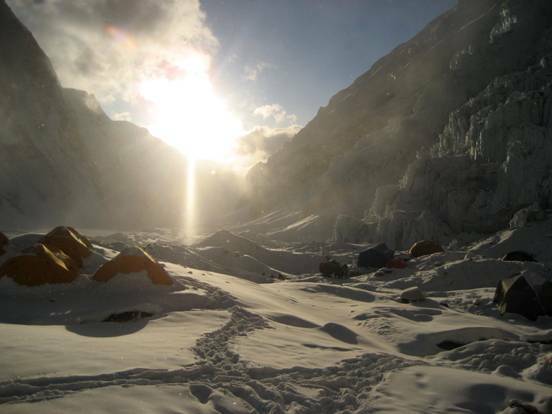 From Camp 1 at the top of the Icefall, the trail crossed the Western Cwm, below Nuptse, to Camp 2. From there it climbed the steep Lhotse Face, glinting icily in the sun, with Camp 3 perched improbably in the middle of it; on again ever higher up the huge face, the route crossed the rock step of the yellow band, where it traversed left to the buttress known as the Geneva Spur. Once over this, you were finally within touching distance of the South Col. It was exhausting just thinking about it, yet it was at this point that the climbing really started. From down below, in the Western Cwm, the upper part of the route was not visible, but I knew that above the South Col it was steep – unrelentingly so – up to the Balcony, on to the South East Ridge and the South summit, then over the last major obstacle, the Hillary Step and onto the snowy slopes leading to the top of Mount Everest. The highest point on Planet Earth. When I saw all this that first time, I just sat down and stared. What struck me more than anything was how far it looked from the South Col to the summit. It looked so far, so far to go in one day. It looked daunting. I had had big mountain days before in my life, but this was on a scale far beyond anything I had ever experienced. Not only was it a long way, but it was also all above 8000 metres. In the so-called ‘death zone’. It was at that point, sitting there looking up at the route, that I really did start to have doubts. I was fairly certain I could make it to the South Col. But after that? Did I have it in me to do it? I knew there was only one way to answer that question. I had absolutely no idea what I could do until and unless I tried.